BMW E30s — 3 series models made from 1982-1994 (for those who don't speak Bimmer) — are cool. E30s that run 12 second ¼ miles are cooler. Electric-powered E30s that run 12 second ¼ miles are very cool. 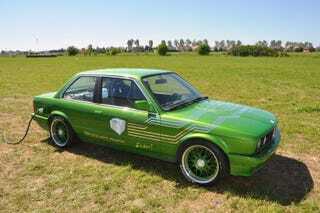 Found on the forums of DIY Electric Car, this Electric E30 is something you have to see to believe. Mate Rimac is based in Croatia and built the 1986 323 E30 you see here. The car serves as a test subject and advertisement for Rimac's business VST conversions. Rimac's car has run a low 12 second quarter mile and beat a Tesla in a street race. He started in February of 2009 wanting to make a car faster than most internal combustion-powered vehicles and ended up with the car you see today. Scroll down for a well produced video and a link to the car's creation from start to finish at the DIY electric car forums.